Use the navigation bar on the left or the map-links to select a place. Alternatively scroll down to see all the entries. Click on photos to enlarge. See all South Korea photos here. I arrived in Korea on the rapid ferry service from Fukuoka, Japan. This was the first time for several years that I had found myself back in the situation of not being able to read anything or talk to anyone, but the Korean people are very polite and friendly, and so there were no problems whilst I was getting my bearings. Immediately the differences between Korea and Japan became apparent as I walked down crowded streets packed with people selling vegetables and chillies straight off rugs on the pavements. Large cars endlessly raced past, aggressively using their horns and old buildings sat dishevelled next to gleaming new ones. Pusan might be a great city to spend time in, but with only 10 days to see Korea, and no great recommendation in the guide, after a somewhat spicy lunch I tried to head off to Gyeongju. Unfortunately I found myself at the wrong train station and after a tricky conversation at the help desk, and learning how to use the subway, I found myself stranded somewhere in town. It was at this point I asked someone at the subway help desk for assistance. He spoke no English but ran off to find someone who did, and this guy not only walked me all the way to the main station but also helped me get my ticket and showed me where to catch the train. I had read in the guide that Korean people can be this outstandingly helpful and polite to solo travellers, but would not have really believed it until I experienced it first hand. The Korean train stations are very new and nice, although sometimes, like in Pusan, people are not allowed onto the platforms until a few minutes before the train arrives, which gives them a deserted and sterile feel. The train was also quite new and clean, although a little slow (there is a fast service but I was on the local line) and I was surprised that the lady pushing the food cart didn't bow when she reached the end of the carriage, although the guard did. I pulled into Gyeongju later that evening and set about looking for a room. I was told that there was an area of town full of motels so headed that way a little dazed at the bustle of the place (I had also been travelling for over 12 hours by this time as well so was starting to feel it). Having not yet mastered any Korean I had to communicate mostly through sign language - I had learned some words from the guide but it took me a little longer to get the pronunciation correct - which brought back memories, but got my self a room for a few nights at a reasonable rate (all motels pretty well charge the same amount, with a discount for off season or multiple nights, and the Koreans, like the Japanese, don't try to cheat you or barter for things, making it very easy). Having got a bed I headed out to find dinner. The Koreans love Kimchi (spicy pickled cabbage) and put chillies with everything which was a bit of a shock to my system at first. They also love to have many small dishes of things, and it is almost impossible to buy a meal that does not have about 10 little dishes of various spicy vegetables. While this is nice, for some reason the Korean restaurants cannot cook of one (everyone in Korea eat in groups so solo eaters are rare), meaning that I could never finish any meals, but also I was limited to only a few things on the menus - although the cost of food is so low that I could quite happy have bought larger group meal, but I hate waste. This family restaurant typified this, and I had a classic bibimba - rice and vegetables with an egg on top which is also popular in Japan - with all the side trimmings and it came to just over a pound. Gyeongju is known as the museum without walls, and is rated as one of the most important ancient cultural sites in the world. Gyeongju was also the ancient capital of Korea and in its day was one of the richest and culturally enlightened cities of the time, with fine art and philosophy. In the town there are a number of large burial mounds dating back a good thousand years I think, and just out of town there is an ancient observatory as well as the remains of many other temples and buildings. After an early start and look around, I continued out to the main museum, which houses many of the treasures found in the area. While this may become a recurring theme, it is worth noting that during the Japanese occupation the Japanese tried very hard to eradicate all things Korean, forcing the occupants to change their names and use Japanese, while knowing down old buildings and vandalising others. When the occupation ended the Koreans found that Gyeongju was largely unspoiled and so started an intensive program to reconstruct and catalogue all such ancient artefacts and buildings. This means the Koreans are very proud of their archaeological site and have carefully labelled and catalogued every thing uncovered so you know you are looking at 'National treasure 115' for example. The Japanese did also give the Koreans much of the infrastructure and know how that subsequently lead to their rise to riches, although this is usually not mentioned, which is probably fair considering the brutality of the occupation. In the afternoon I tied to make my way out to a large forested area just outside the town, but maps are not overly plentiful and I must have missed the correct path as I spent hours wandering busy roads and then through the country side. 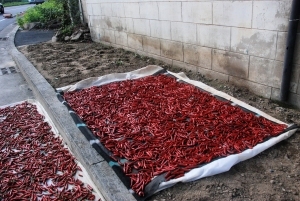 This was interesting in itself as development has not yet reached that deeply into the countryside in Korea, and see the hundreds of chillies sitting outside the houses drying. At last I made it into the woods and found a few ancient shrines - the lure of this wooded area is that there are hundreds of shrines and ancient sites which are all connected by thousands of little trails. By this time I was starting to get a little tired and knowing it was a good few miles back into to town I turned around and made my way back. It was only 5 when got to the main street and so I found a local cafe that sold very good hot cakes and tea and spent a long while there, listening to the serving girls until I knew how to say hello and thank you politely in Korean. I'm not sure if bakeries are a new thing in Korea but they are amazingly popular. This place was cooking probably 40 of these hot cakes (hard to explain but like a soft tea cake with butter inside, quite plain but with a nice taste) every 10 minutes and they were being sold as soon as they came out of the oven, and it was like this all day as far as I could tell. After a twilight walk around the burial mounds on the way back to the motel area I found another restaurant and had a Ramen (noodles) dish, which was again quite spicy. On my second day in Gyeongju I caught the local bus out to Bulguksa, another very famous area nearby. The bus was packed with school boy, all off to a big water park near by, and they were all very inquisitive about me and wanting to practice their English, which was quite good considering they were probably only about 10 years old. I have become quite used to standing out from a crowd, but the Korean people are much more forward than those of Japan making conversation easier, and I was often surprised at the level (or perhaps more importantly the confidence) with which people spoke English, the notable exception being people in the motels and restaurants - these places really only cater for Koreans so never need to use English I guess, but after a few days my Korean was sufficient in a very basic sense for these encounters so it was no problem. Bulguksa is a very nice area with some excellently preserved temples. I walked around the main site and then hiked over to a further out place before having a massive and very spicy lunch in the town just away for the temples. I then went back to Gyeongju and again spend the last of the afternoon in my new favourite cafe. The following morning a check at the bus terminal stopped my plan to head along the coast as I had just missed the only bus, so instead I caught a train to Seoul. Some cities you can fall in love with straight away, and for me Seoul is one of these. Development has been very rapid in Korea, but not so rapid as to have removed all traces of the past. Seoul has many small winding streets, packed with street vendors and markets, but also has a modern subway and towering new buildings. The smell of rotting fruit and sewage occasionally wafts from alleys, reminding me of India, but air-condition is never far away and there is a feel of development and wealth that can only be felt in East Asia and temples and palaces still take pride of place through out the city. I arrived in Seoul mid afternoon, and it took me a while to find my way out to the hostel in which I wanted to stay. I dumped my bag and then walked out around the market and parks in the busy northern area of the city. The transport really is crazy, everyone seems to own a brand new large estate car, and millions of these are driven as if they are mopeds, screaming up and down the congested street. My guide book warns of motorbike on the pavements but perhaps this has been cracked down as there was only one every few minutes, and they normally tried to avoid pedestrians. What also amazed me was the number of police. South Korea is currently going through a period of rapid change and the general public are starting to find their voice in form of demonstrations. Whether it is for this reason or the fact that North Korea is less than 50 miles away I'm not sure, but on nearly every corner there seemed to be one or two busses with meshed windows and large numbers of police, most of which I would guess were under the age of 25. It turned out, not surprisingly, that there were quite a few Japanese staying in the hostel, so I was able to chat to them a bit in the evening - Seoul is a very popular weekend trip for many Japanese, and most of the Korean tourist trade is geared to this. The following morning I headed out to the west to see the Shamanist area of Seoul. Shamanism is still a major religion in Korea and, while the area has seem a lot of new development in recent years, the top of a small hill is still dedicated to many small shrines and places of worship, all made from brightly painted wood and set around narrow winding paths. There was a strong small of incense in the air and the occasional bell toll or muffled sound of chanting broke the calm of the air. I had a quick wander around but it felt a little intrusive and I wanted to catch one of the few daily tours of the grand palace, so headed back into town. Changdokkung Palace is the grandest of the palaces in Seoul and is set in impressive grounds. Visiting is only possible on a tour, and so a group of about 30 of us were taken around and given an explanation of different buildings by a nice Korean guide. The explanations about the architecture and layout of buildings were good, as were the descriptions about the way of life of the civilisations which lived under strict Confucianism rules. After the tour I headed into the city centre for a quick lunch in a cafe and then did the walking tour around the heart of Seoul. I particularly liked the walk along a steam, which had been very nicely done and engineered to provide some calm from the city and features a number of water features and sculptures. One of the greatest sights in Seoul is a giant city gate, which is shown in all Korean tourist magazines. Unfortunate at the beginning of 2008 this whole structure was burned down in an arson attack by man protesting against the cost of land. This hit the South Koreans quite hard as it is one of their greatest monuments, and I was not sure whether it had been rebuilt when I arrived. Unfortunately for me the reconstruction is still under way so I hiked back through the old markets and up to the hill which sits at the middle of this city. On the top of the hill is tall tower, with a commanding view over the city and into the mountains beyond. It was a reasonably clear day so the visibility was good and the toilets were some of the most impressive I've ever seem, with large glass windows giving a commanding view. Back in the city I faltered and went to Burger King as the thought of more spicy kimchi was too much for me. If there is one thing the Korean people really love it's hiking, and I am fairly sure that the nation as a whole must either be sponsored by North Face, or have chosen it as their new national dress. Without exaggeration it seems half the people not wearing a suit or uniform can be found with this label somewhere about their person. And it is not hard to see why, as Korea has some amazing mountains, and large amounts of the land have been set aside as national parks which are filled with well maintained footpaths. This was very pleasing for me as the Japanese are not such keen out door people on the whole, and good footpaths can be hard to find. Of all the National Parks in South Korea Seoraksan is perhaps the best, and being only a 4 hours by bus from Seoul makes it easy to get to, if rather busy. I arrived here on a Thursday, thinking that it might be hard to find accommodation over the weekend, although, like everywhere in Korea it seems, there are far more motels than really seem necessary and the place I stayed was largely empty the whole weekend, although it was the end of the season and there were a generous number of mosquitoes each night to keep me company. I was most pleased that as I was walking up to the front of the motel the owner came down the steps and I was able to shout in Korean over the road to find out if there was space, and then check in with relative ease - over the past days I had spoken to many Korean in English and had be checking the pronunciation of things so that after nearly a week I was able to get myself understood more easily. On my first day in the Seoraksan National Park I took the cable car up to the peak and back (the only way to visit it), then did a walk up one of the valley to some waterfalls before lunch then hiked out past some temples and up into the peaks on the other side of the valley in the afternoon. The weather was warm and sunny and I chatted to many friendly Koreans out enjoying the walking. The afternoon walk was quite tough, and the way up to the peak was on a long steep metal staircase that gave quite a feeling of exposure. I was staying a mile or so outside the park so was quite warn out upon my return. The food in the area is quite basic and I found myself for the second night running with bibimba made from lots of very stringy mountain vegetables, followed by some cake form the convenience store to bring my sugar levels back up. On my second full day I headed further into the mountains along a river that passed through long gorges and poured down many waterfalls. It was a beautiful day and an amazing walk, and I was lucky that after 6 miles or so there was a camping ground where is was possible to buy water - I was getting rather thirsty already and would have to have turned back otherwise so it gave me the possibility to keep going a bit further. This was a Sunday and even quite a long hike from the start of the reserve I found loads of people, all happily trekking through the landscape, and thoroughly enjoying themselves. One guy I met remarked that at his age (I guessed about 60) he now needed a week's holiday each year, and so had come out for some trekking, but most I think were just on day trip from Seoul. When I finally made it back to where I was staying I could not face another bibimba, so went for the only other option which was fried chicken. I walked into the little shop and the woman pointed to the picture of fried chicken and I said yes and paid about 2 pounds. When it arrived it was in fact a whole chicken with some trimmings in the form of a tub of pickled vegetables. I was so hungry that I ate the whole bird, although felt rather bloated afterward, and required no cake. The next morning I got the first bus out of the park and then caught the express bus back to Seoul. After another day in Seoul it was the end of my trip through Korea so I made my way to the international airport at Incheon. Since my flight was an early morning one I opted to spend my last day travelling out to the island then spend the night at the airport. I first caught the subway out to the city of Incheon, at the end of the line, and had a quick look around. There was a small China town and a large port, but I could not get overly close to the dock to see any of the large container ships, which had been my plan, so I walked to the ferry port and caught a boat over to Incheon Island (I can't remember if this is the islands name but this is the name of the airport that sits on it). My guide said that the ferry port on the island was a nice place for lunch but, like much of the area, it was under redevelopment and the whole place looked like it had been the centre of a small war. After an hour a local bus arrived (I missed the one that met my ferry as I was looking at the collapsed buildings) and took me over very winding roads to the airport. I think the area here typified Korea in many ways. The area was predominantly farmland with some old buildings but every so often we passed either new or nearly complete blocks of flats. I had seen the same type all over the country, found in sets of at least 6, with each being about 10 or more stories high, they look very modern but somewhat out of place with the expanses of open space around them. I guess in a few more years the rest of the development will catch up and the scene will be very different, but at present it gives the feel of a country undergoing a rapid improvement in the quality of life for all. That night I stayed in a nice hotel nice as it was on a half price deal at the airport and had an excellent meal in its restaurant. There was little of interest in area, and having an early start and a 30 hour travelling day to look forward to I didn't explore too seriously.